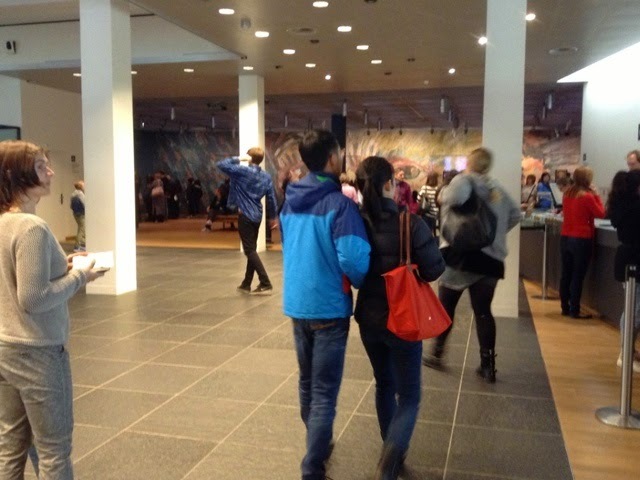 This post is mostly about visiting the Van Gogh museum in Amsterdam and very little about anything you might see inside since it is absolutely verboten to take any photos (except in front of a few large blowups of THE SUNFLOWERS on the landing you can taket a selfie). 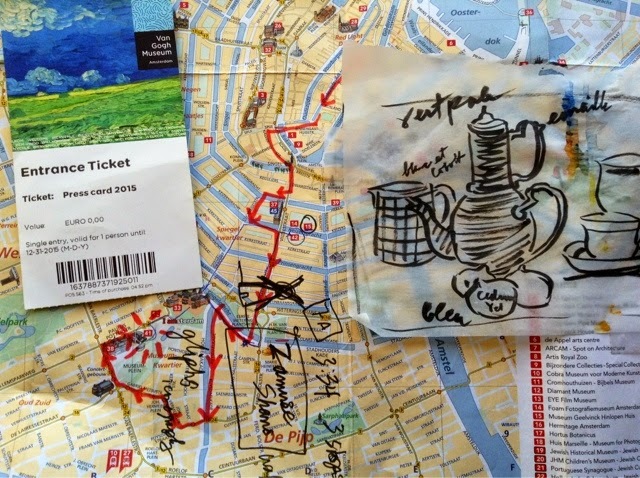 Solli was navigating that morning and promised it would take us just 15 minutes from our B and B to get to the Vah Gogh. Ha! One hour later we arrived at the Rijksmuseum just in front more or less of the VG museum...mostly less. When you travel with a tall person you must run to keep up. And No, I did not lose any weight with the constant running because we kept eating Dutch apple cake. 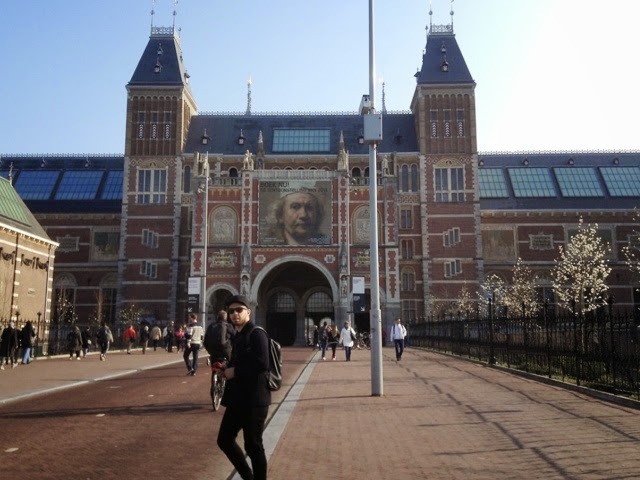 Admittedly ALL of Amsterdam is scenic..
Once there by 10:00 the lines were already horrendous. We had special passes that got us in entrance #4 fortunately. Still picking up our passes was no easy thing since the Staff Entrance was completely covered with renovation never mentioned to us. Luckily some staff came along and let us in. We got our special passes and then had to go around to the front of the building (another 15 minutes) to enter. 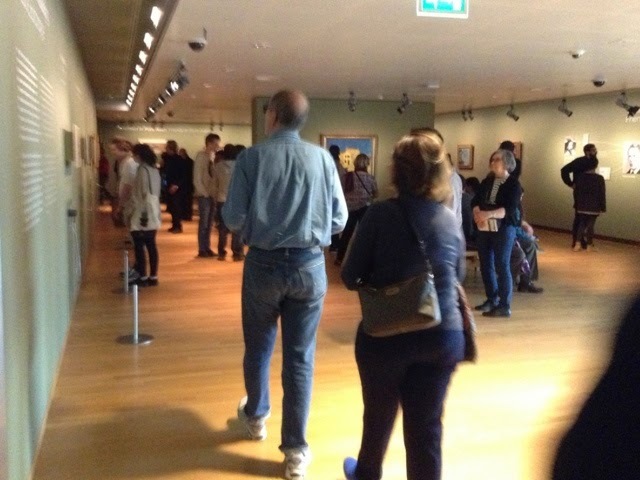 This is the main floor of the Van Gogh museum - shhh a stolen shot. This is the 2nd floor - another stolen shot taken from the elevator. 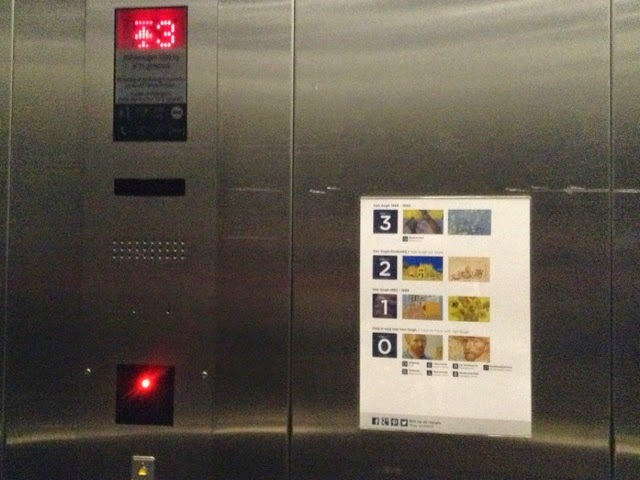 A shot inside of the Van Gogh museum elevator! Was I being filmed? A close-up of one of my favorite Van Gogh drawings on the elevator wall. Solli and I split up since I have visited the museum maybe 10-15 years ago and that was enough for me. I went straight up to the bookshop on the 3rd floor. I drooled over several books, buying a couple (in Dutch and for kids) because I liked the pictures. My fav still life again. Have I mentioned we are both congenitally late? We would meet up in 50 minutes at 11:00 on the ground floor on one of the two big benches Solli designated. I even arrived 5 minutes early. At 11:15 I figured, OK, give her extra time with the Van Goghs. Be a little generous. Who knows when she will be back again? At 11:25 I was beginning to steam. There is Solli sitting on the other big bench. She has been there since 10:55. What to do? One isn't even allowed to be annoyed when the other person has not in fact kept you waiting. Outside that VG museum Solli spotted big pots of tulips. Our chance to get some tulip pictures!!! Though frankly I could have cared less. 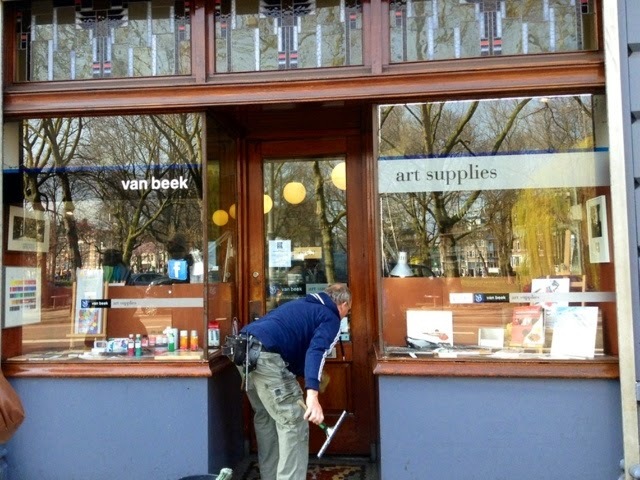 To request we visit the Van Beek Art supplies shop, not so far from the VG museum. The folks in the bookstore gave me directions. With items on SALE, something you rarely see in France in any store except during the Solde. In fact they had those extra large pans of Winsor and Newton watercolor I like so much but left behind in NYC. AND they were on SALE! Hooray. 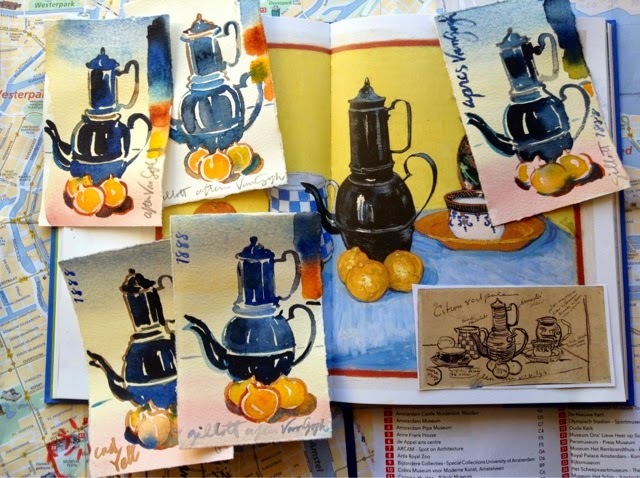 I painted some little Van Goghish versions of the teapot still life for anyone who wishes to subscribe or renew their PARIS SKETCH LETTER SUBSCRIPTION. 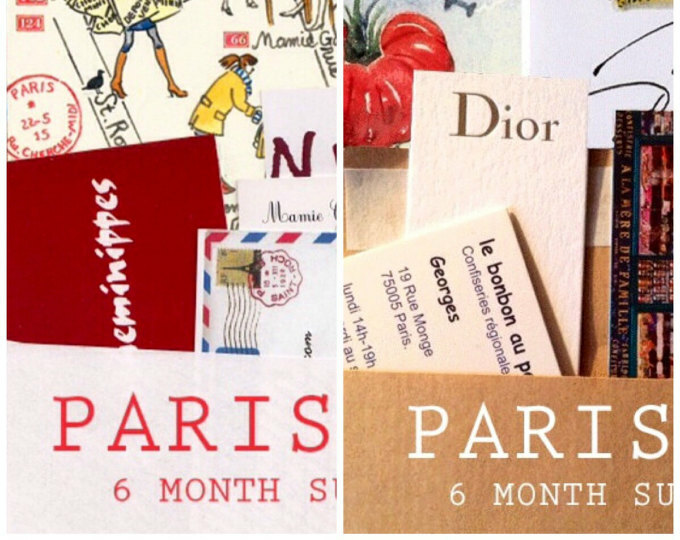 A little gift-with-purchase (GWP) you might say. 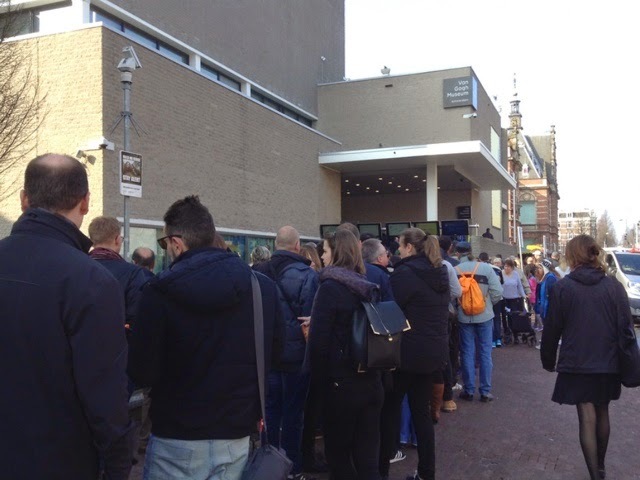 So that was our mostly uneventful visit to the Van Gogh museum in Amsterdam. You sound like my husband and I, arranging to meet and missing each other! The tulips are lovely, thanks for stopping long enough to shoot some. 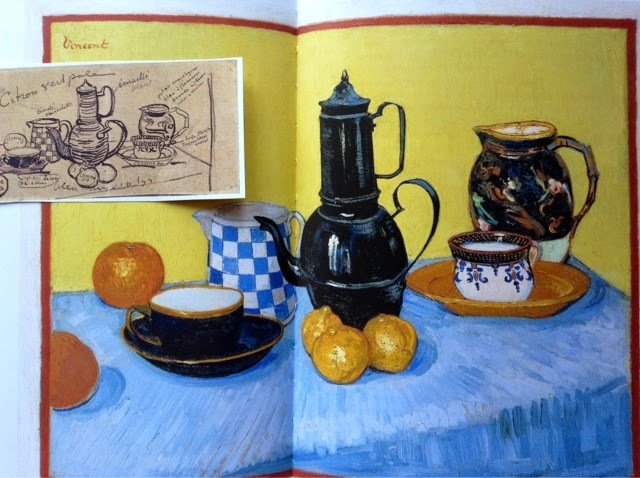 The Van Gogh still life with blue table cloth was new to me - and splendid. Gosh how I hate waiting for people - it makes me very grumpy indeed. Hope to see you in England in May? I Hate waiting too Elizabeth, yet I am usually late though never for trains or planes. I need my head examined...oh wait. Been there, done that. Solli says we were late to the museum because I had to look in every window on the way and never stopped chattering. Google says our jaunt should have taken 16 minutes only. I have absolutely NO sense of direction..I would have started to panic..in Asterdam.. in a museum..and I am not able to find my guide/freind? I know because once I had a signing downtown..my husband drove me and my daughter came along for the ride..they dropped me off and I was to call her cellphone when done..I did..mailbox full!! Thankfully a really nice homeless person came to talk to me.. and he told me his was his chice etc etc.. I had $5.00 and gave it to him and we chatted.. but before that I was in tears..anyways they finally showed up..in hysterics..because of what I was doing..they said they would never leave me alone again.I moved to the country when I was 20..I know nothing about cities..etc.. I am really the worst person to have to take care of. Your renderings are gorge Carol!Your shadows:)Love.Or as one of my daughters would say:"me lovey"..
Parrot tulips are my favorite..more than fringe etc..
Oh you underestimate all of your many gifts Monique so I dont believe a word. thank you for your posts and I am so glad you had a wonderful time. 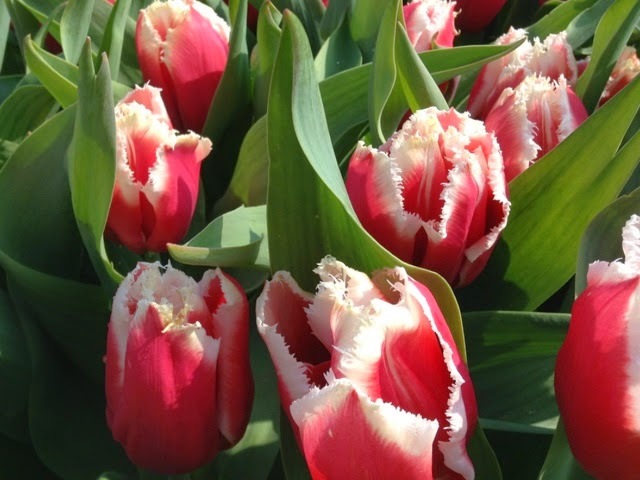 I hope you will return when the tulips are in bloom. 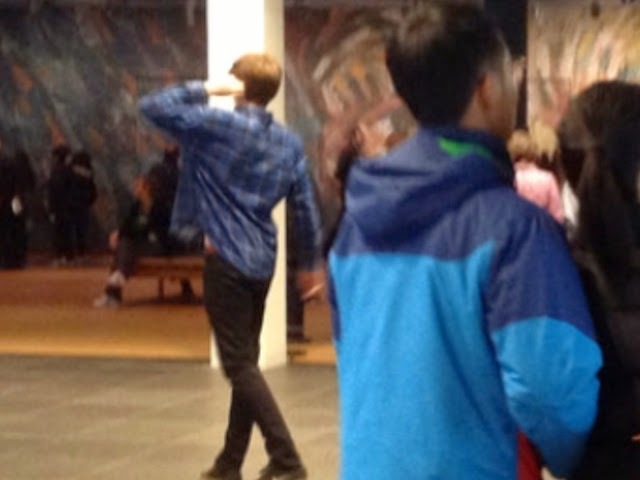 So I am not the only one who takes forbidden pictures in a museum? Carefully and discretely, of course ! 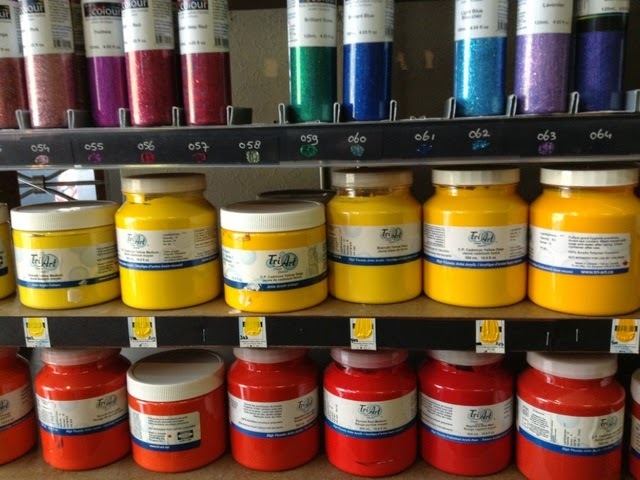 The art supply store looks lovely - all those colors ! 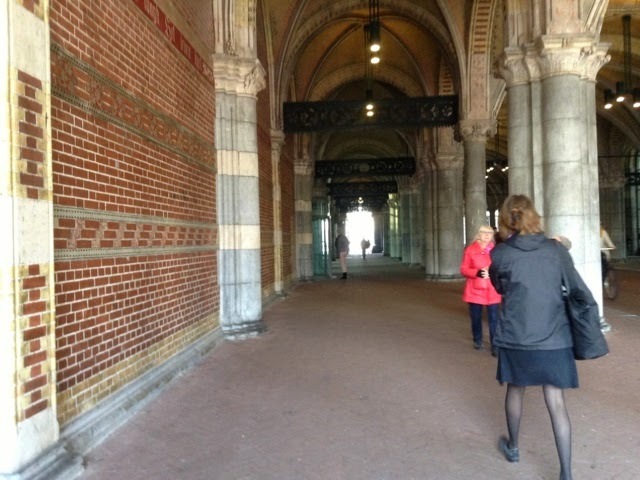 Thanks for this peek at Amsterdam. Lovely! 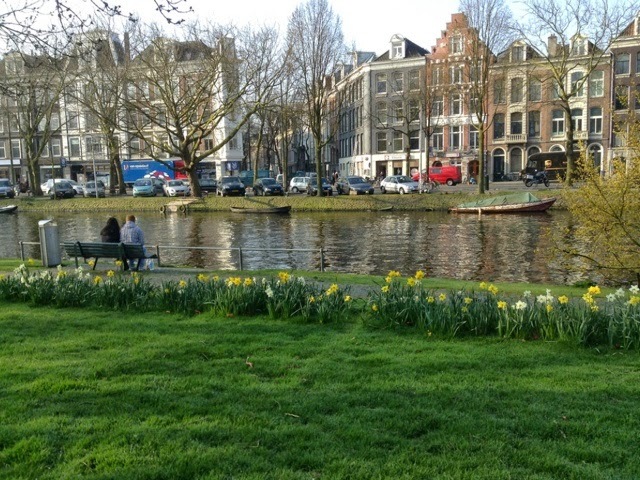 I so want to return to Amsterdam and do a tulip tour! The crowds in the museum were discouraging. When I visited, it was not at all crowded! But the art shop was yummy. Luscious, indeed. Definitely more people now. It was renovated recently. Catching up on your Amsterdam trip -- one of my favorite cities, by the way. 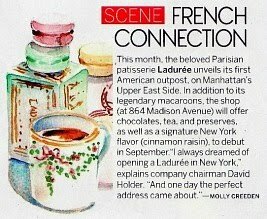 When I saw the "late" in the title, I thought you might mean April Paris Sketches are late. Have they been sent yet? I saw the one you did with my name (Happy, Joy!) but nothing has arrived yet and usually they are earlier. But then, I know life happens. Thought I'd check! 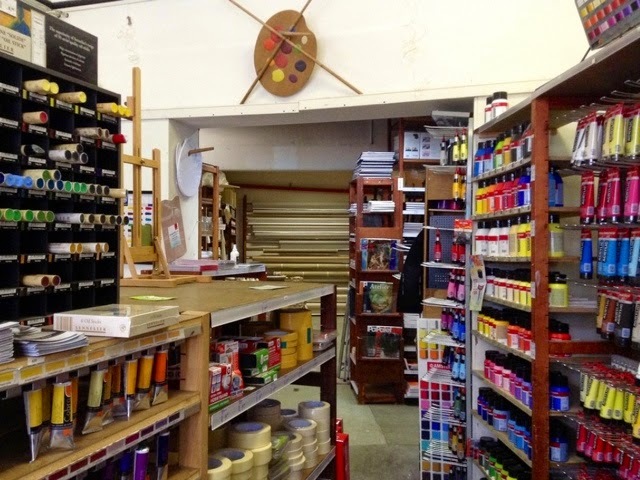 I would simply explode with joy in that art shop! 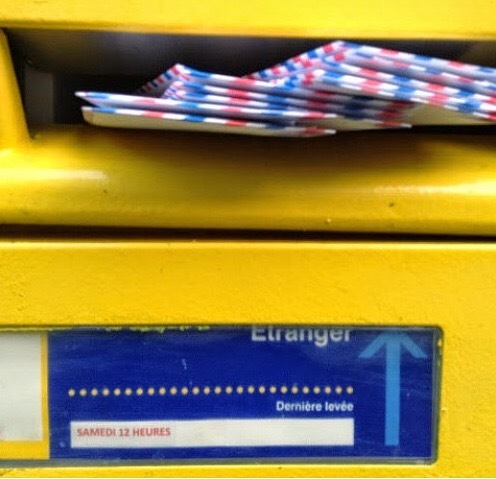 I just sent you an email Jeanie re: Paris letter. 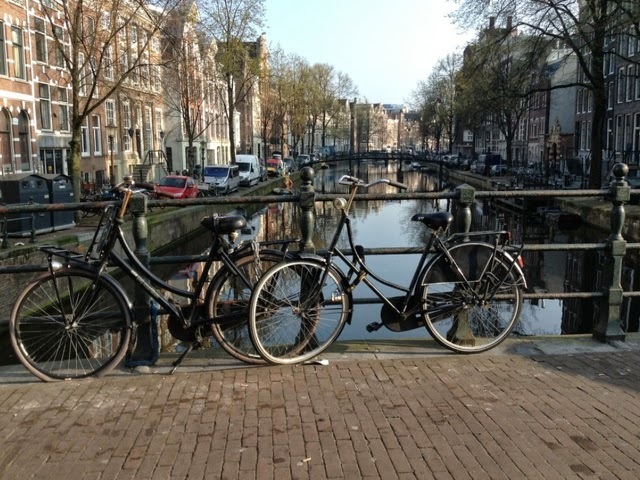 Loved all your pics and can identify with a lot of your experiences on your trip.My friend & I took the bullet train from Gare du Nord to AMS on Monday 4/6 for a couple of days.Amsterdam is as beautiful as I have heard.But,watch out for those bicycles!! Then we jumped on our 3 night Croisi Europe river ship cruise ending in Antwerp. 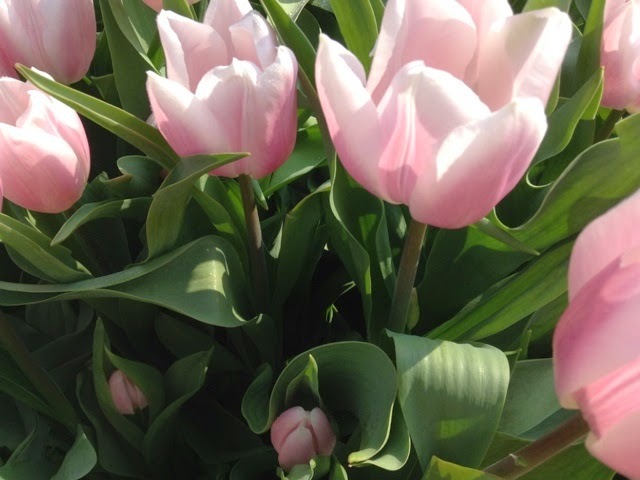 We did tour the Keukenhof,and though not at it's peak,many beds had lots of blooms.Knowing that this was our only opportunity to go,we were happy with the garden. 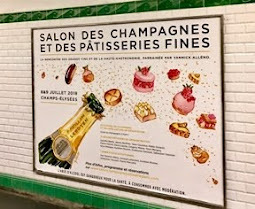 This is getting long,but I did use you your blog to choose some new fun places to visit on this trip.Merci for that. I was actually kidding just a little.But next April,expect an email,and maybe some treat from SD (chocolate chips,or whatever you'd like). You know that I mean't Notre Dame. By the way,I am the proud owner of two pink aprons,and two broken macarons bags.I will share with friends. I ��LOVE�� that you went straight to the bookshop on the 3rd floor! That's what my daughter Beth and I have done all our lives. wanted you to know how much Ive enjoyed your postings from Amsterdam!! Your still life painting looks beautiful! A lovely post as always. If you're still there and have time, the Katt Kabinet cat art museum is charming. Yikes! That bench waiting mishap once happened to my hubby....but I am glad you managed to get a little deposit into your favors balance with the tulip photos. I took lots of pics at VGM last May. I was at the special exhibit of works by Felix Valloton, which I loved. Maybe it's just Vincent's work that's off limits. Always love your posts. 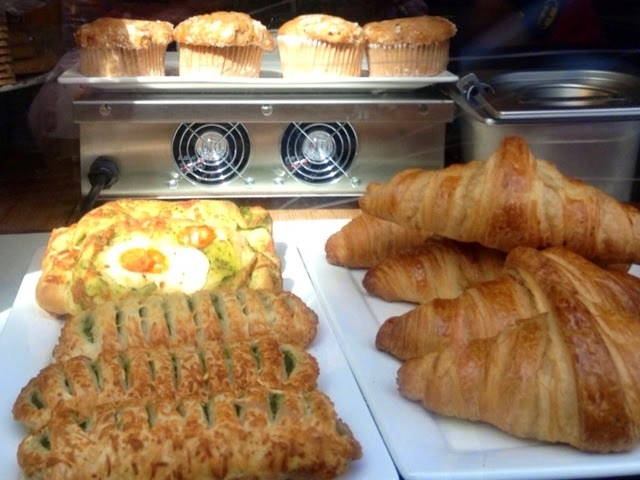 I'm loving your Amsterdam posts! What a fun adventure. 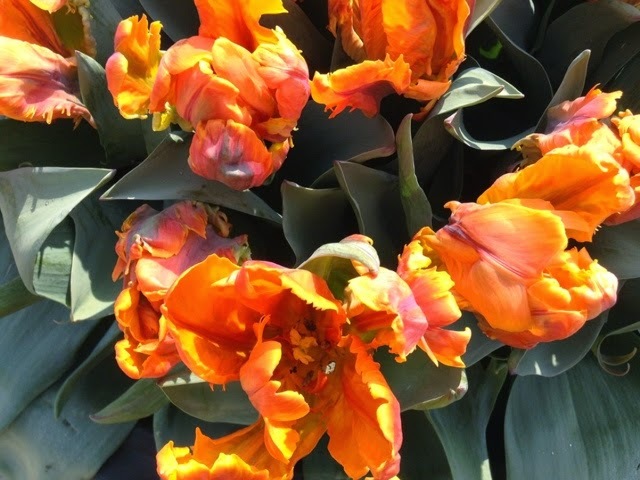 I love tulips, especially the ruffled ones and your pictures are so beautiful. Thank you for your sneak peek in the VG museum! Loved your Amsterdam posts. You have inspired me to get to Amsterdam, tout de suite! 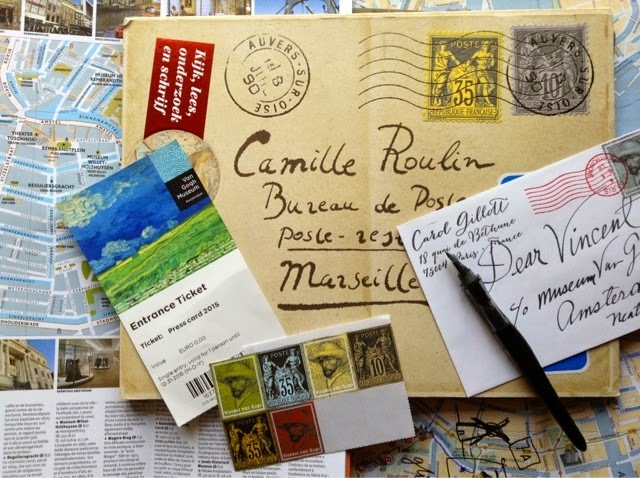 Your April Paris Sketch letter was gorgeous, as always! Particularly liked all the little goodies you enclosed; all regarding chocolate no less! Made me very happy. Next year will have to re subscribe in Bob's name so he has his name on a watercolor. 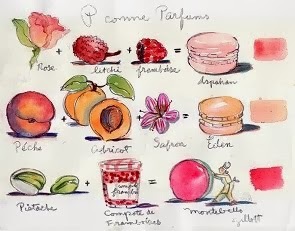 But then, he has your Dernier Goutte watercolor so he is WAY ahead! 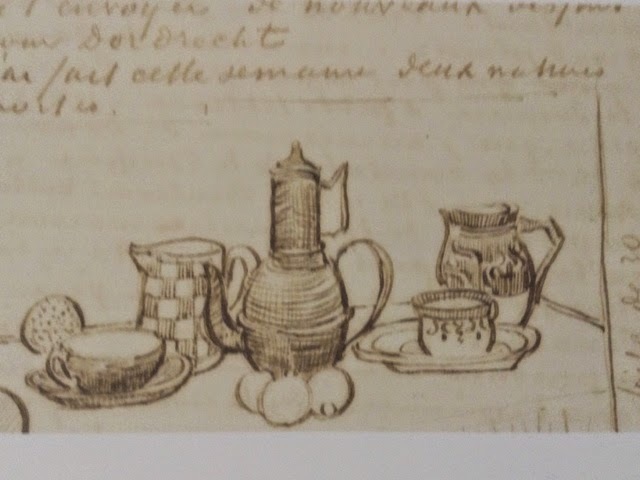 Wish I was re subscribing now for one of those gorgeous tea pot still lifes. Nice work! 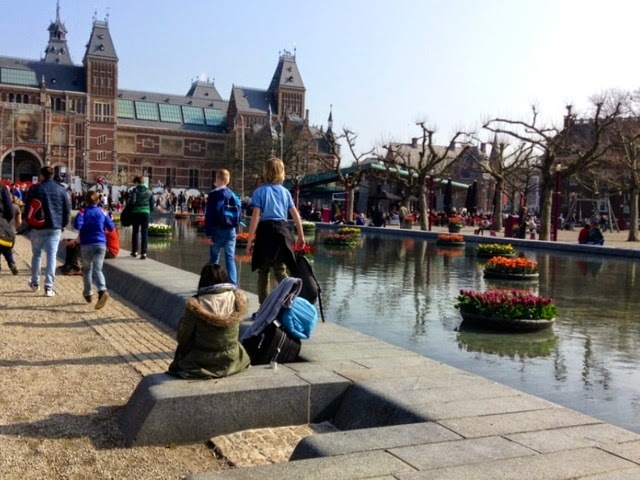 I love the exteriors - the tulips, the canals, the sunshine - more than the museum! It seemed like such a hassle! At least you didn't have your camera spotted! Love your water colors at the end. I too wish I was resubscribing now! I can just imagine how frustrated you must have been, waiting on that bench, only to find that Solli was doing the same:). Enjoy your nice weather! I will do more Van Goghish Bonus watercolors for later subscribers! Who knew they would be a hit? Very amusing and enjoyable post ... Your rendition of the Van Gogh is fantastico!